Effigies are a team from London who play six or seven games a season, one of them a touring match and, in true Richard Clare mode, they go to a different country every year and to date have never returned, not, I would add because of their unruly behaviour. They have toured to countries where MCC has not yet been such as Estonia, France, Iceland and Malta. They provided two umpires for both innings, one of them (Bob Eaton) played for the British Lions in Bulawayo during the South African tour of 1974 and the other (Hugh Ellerton) was wearing a pair of deckchair design trousers owned at one time by Elton John. How he came by them no-one knows and no-one really wishes to know. As the Effigies had suffered from a number of baillages three MCC members – O`Connor, Soundararajan and Jadwani – volunteered to play for them to make a game of two ten-a-side teams. Plentiful teas were provided by Jadwani and O’Connor and included some uncooked eggs, a definite first in the MCC catering history. After the break, Scott and Blades opened the bowling for MCC and bowled their full allocations straight off, Blades taking two wickets and, after 12 overs, Effigies were 45 for 2 (MCC had been 56 for 2 at the same stage). Clare and Wright took over for three overs each, kept the run-rate below that required and after 18 overs Effigies were 80 for 2 (MCC had been 95 for 4 down). Kavi, fresh from his 3 for 2 last week came on with Garner but was tonked for 24 off 2 overs – cricket can be a soul destroying game. After 22 overs Effigies were 120 for 2 (MCC had been 109 for 4) so the captain brought on a very nervous secret weapon named Hobbs. He and Garner almost did it, Effigies losing another four wickets, one of them the Effigies top scorer, caught by Michahelles, a superb catch in his first game, before scoring the winning run off 29.3 overs. An enjoyable, friendly, but competitive match, with some wonderful sledging by O`Connor, finished at around 5.30 pm allowing us plenty of time to attack Helmut`s cool fresh before retiring to the Chinese Tower. Kavi, DNB, 2 overs, 0 mdns, 24 runs, 0 wkts. MCC, 157 for 7 lost to Effigies, 158 for 6 by 3 wickets. MCC, resplendent in their new leisure kit, turned out in force to play a bat 12 field 11 fixture against the Munich Boys at the Hirschanger. Some thought that batting wearing sunglasses under the helmet was going a little too far but, as Basil Fawlty said “you wouldn`t understand dear, its called style”. Be that as it may, captain Weston duly used Maria Theresa to win the toss and decided to field first. Blades and O`Connor opened the attack for MCC and forged ahead with the wide count; after six overs the Munich Boys were 34 for 0 of which 13 were wides. Apparently the ball was swinging profusely. Rabbani and Weston took over the attack, bowling slightly fewer wides and two wickets fell in Weston’s first over, one a run out, the other clean bowled. After 14 overs the score was 94 for 2 and on came Hobbs, terrified that he would bowl pies and ruin his position at the top of the bowling table. He was sporting a 60`s style Django moustache hoping to scare the batsmen into giving away their wickets. His first over went for 17, including two sixes and a four so pleas for a safety razor were heard. Wright, at the other end, bowled economically taking a wicket in his first, second and fourth overs. With Hobbs taking one in his second and bowling a little tighter, things were looking slightly better but, after 24 over overs when Hobbs and Wright were replaced by Wasiewicz and Kavi, the score was 177 for six down. The problem for MCC was that Khan, who had been dropped when he had only a few runs on the board, went on to score 123 before being stumped by Van Giezen off Kavi, having hit 8 fours and 10 sixes. Khan was in fact the eleventh wicket to fall (bat 12, field 11) and Munich Boys finished on 230 for 11 after 29.4 overs leaving MCC needing slightly under 8 runs per over to win. After a splendid tea provided by Brunskill, MCC opened with Brunskill and Wright. The target of 8 an over quickly disappeared over the horizon and, after six overs MCC were 19 for 1, Wright having been bowled for 12. Rabbani and Brunskill put on another 9 runs for the second wicket before Brunskill was bowled for 4. He was replaced by the shades wearing Caspari who rather unfortunately played across a straight ball and went to join the duck race. Rabbani and Van Giezen put on 10 runs before Rabbani went for 12, stumped by Ali. In came Miller who went first ball after getting a real bummer of a caught behind decision but, like a good Kiwi, he didn`t hang around to protest. In came Hobbs, very relieved not to have been toppled from the top of the table and proceeded to top score with 18 off 31 balls including 2 fours. Wasiewicz had replaced Van Giezen who went for 9 and O`Connor now came in for Hobbs after he and Van Giezen had put on 26, the highest partnership of the innings. O`Connor had another of those simply unplayable balls and went first ball, clean bowled by a snorter from Amir. In came Kavi, determined to face more than 1 ball and not move up the duck race table. In fact he and Wasiewicz put on an unbeaten 22 for the 9th wicket scoring 11 and 15 respectively. MCC finshed on 99 for seven after 30 overs, slightly short of the 231 required. Blades, DNB, 3 overs, 1 mdn, 12 runs, 0 wkts. MCC, 99 for 8, lost to MBCC, 230 for 11, by 131 runs. It was a “is it or is it not” sort of day. There had been heavy rain for some 70 hours by Saturday morning and rain showers were forecasted throughout the day. Around 10:30 Roshan of Lufthansa rang to confirm that we were coming and most of us met at 12:30 at the Hirschanger to collect the kit and join the traffic jams on the way to Attaching near the airport. Rumours that half the Lufthansa team would not show up because they were on strike were unfounded. As we travelled more to the north the weather improved, the roads were dry and it was clear we would get in a full game. Maria Theresa did her stuff and captain Weston chose to field first, feeling our bowlers would contain them to an easily chaseable score as in the previous rounds of the competition. The opening pair of Scott and Blades did well, Scott being particuarly impressive with figures of 2 for 11 from his four overs. At the half-way stage after 10 overs Lufthansa were 35 for 2 and looking really concerned. Six bowlers were used to prevent the batters from settling, Wright and Ferguson being held back for the death bowling. There were a couple of lusty hits for six but, after 20 overs, Lufthansa were 101 for 7 and MCC feeling pretty satsfied with themselves. With four other league clubs playing in T20 knockout matches this weekend it was back to our old friends Pak Orient for a friendly match – no arrogant messages about putting out a good team from them, they like to stuff us by as many as possible. Heavy overnight and early morning rain made an abandonment a distinct possibility but the heavens cleared and we were ready for a 1 pm start. Captain Weston, bleary eyed and hung over from leaping around in his army boots in a disco until 4am and burning up 1700 calories in the activity, won the toss and chose to field. I think this decision was based on giving opener O`Meagher, who seemed to have celebrated Friday night even more than Weston, some breathing space before batting. The wonderfully named Sher Khan and Janan opened for Pak Orient to face MCC opening bowlers Gill and O`Connor. They batted as if there was no tomorrow and, after 9 overs, were 94 for 1. Jadwani had replaced O`Connor but his style was also very much to the batters liking – they even complained he was throwing but as they were tonking him for fours the protest was not taken seriously by the umpires. After 12 overs, with the score on 112, the skipper brought on the first of his secret weapons and Hobbs bowled a modest first over going for only 7 runs. After the drinks break, Clare who had kept wicket and not given a bye or dropped a catch, was replaced by Turner who arrived just in time for the drinks. Sobek now joined Hobbs and his first four balls were “w”s – wicket, wide, wide, wide. Why on earth he was allowed another over no-one knows but the captain. However, the concatenation of the lightning fast Turner behind the stumps and the donkey-drop tempters from the two slow bowlers was simply breathtaking. From 129 for 2 after 15 overs, Pak Orient subsided to 168 all out after 26.4 overs, Sobek with a three-for, Hobbs with a six-for, including a hattrick. However the bleary eyed captain fell down on his counting and allowed Hobbs to bowl 7.4 overs when he should have been restricted to five. As so often in our matches the wide count was very high – the third highest score but the ball was very wet and slippery. After teas MCC opened the batting with O`Meagher and Clare. Two wicket maidens later the score was 0 for 2 and Weston and Hobbs were at the crease. Weston went for 9 with the total score on10 but then Hobbs and Turner put on 23 for the 4th wicket, Turner facing 24 balls, keeping his end up in scoring his 3 runs. Next in was new member Anil Kavi who hadn`t played for two years. He decided the only prize worth going for so late in the season was the duck race and went after facing one ball. Now came the other secret weapon, Sobek, who put on 12 for the 6th wicket with Hobbs and another 12 for the seventh wicket with Gill. Gill went for 2 and in came Soundararajan, determined to improve on his performance of last week. Sobek went for 10, the only double figure score so far after the umpire tried desperately to find a reason why he couldn’t give hime out LBW and this introduced a nervous Jadwani to the struggle. He and Soundararajan put on 10 for the 9th wicket before Soundararajan fell for 4 and allowed number eleven, O`Connor, his chance to shine. This he did excellently remaining on 8 not out and putting on 30 for the 10th wicket in a partnership with Jadwani who top scored with 19. MCC finshed on 89 all out after 26.4 overs so were soundly beaten but had a wonderful day with many memorable happenings. We sat around sampling Helmut’s cool fresh until 7pm then decided to go for one more at the kiosk in poofters alley. At 7:30 the heavens opened with torrential rain for almost two hours so we were forced to extend the one more into two more and so on while`st watching the rivirs of muddy water streaming past. MCC, 89 all out lost to Pak Orient, 168 all out, by 79 runs. Finally, summer had arrived with temperatures over 30°C, clear blue skies, three crates of cool fresh in the changing room fridge, plenty of shade for the scorers to sit and mock the perspiring fielders all day long and an opposition whom we had stuffed in a recent fixture with a very friendly MCC team but who had written that they hoped we would put out a “proper” team against them for this match. So we were more than up for it, to the extent that captain Weston actually won the toss and chose to bat in a 35 over fixture. Sarma and Clare opened the batting to face Johnson, he of Sir Richard Turnbull fame, and George, and scored at a healthy 7 runs an over until Clare went for 38 off 37 balls in the eleventh over with the score on 69. Weston and Sarma put on another 54 for the second wicket, Weston hitting some almighty sixes and powerful fours in his 34 off 19 balls. Sarma and Hobbs took the score to 187 with a third wicket partnership of 64 before Sarma, who had really looked to be on a hundred played across a straight one and was clean bowled for 75 off 75 balls, the score now being 197 for 3 down. Soundarajan departed five runs later after joining in the duck race having faced eight balls. Wright came to join Hobbs, who was having the time of his life, and scored 8 off 10 balls allowing Fudge to come to the crease. Hobbs fell for 39 off 43 balls in the next over, this being his highest score for MCC, to be replaced by O`Connor who decided not to be upstaged in the duck race and went after facing one ball only. In came Sestan, the Croatian Killer to meet the hattrick ball with a straight bat and survived the rest of Johnsons double wicket maiden over. Sestan and Fudge put on 23 for the eigth wicket, Sestan being run out on the very last ball of the innings – remember to ground your bat Igor – and MCC finished on 240 for 8 after the 35 overs. After a splendid tea provided by Fudge, complete with his infamous boiled eggs, MCC toook the field and opened with Gill and Jadwani who hadn`t batted in MCC`s innings. Gill struck with his fourth ball, getting the MIC opener Srini for a duck, LBW. In his second over he got the MIC captain Obaid, clean bowled for 4 and in his third over, Jadwani got Pramod clean bowled for 2. MIC were now 30 for 3 after 5.5 overs and in trouble but Kashif was at the crease and he was a joy to behold. He finished on 128 off 114 balls with 15 fours and 3 sixes, being out finally, caught Fudge, bowled Wright with the score on 196 for 9. Sestan, who bowled very well and took 3 for 40 almost got him caught behind off a ball that the umpire called a wide despite a convincing appeal by all those close around the bat. MIC were all out for 197 after 31,3 overs only Amit with 16 scoring above 10 runs and the victorious team enjoyed a swim in the Eisbach, loads of Helmut`s cool fresh then repaired to the Chinese Tower to discuss tactics until around midnight. Note to Gill: It is extremely bad form to swim without your togs and even more so to swim with a bottle of cool fresh in your hand. MCC, 240 for 8, best MIC 197 for 10, by 43 runs. 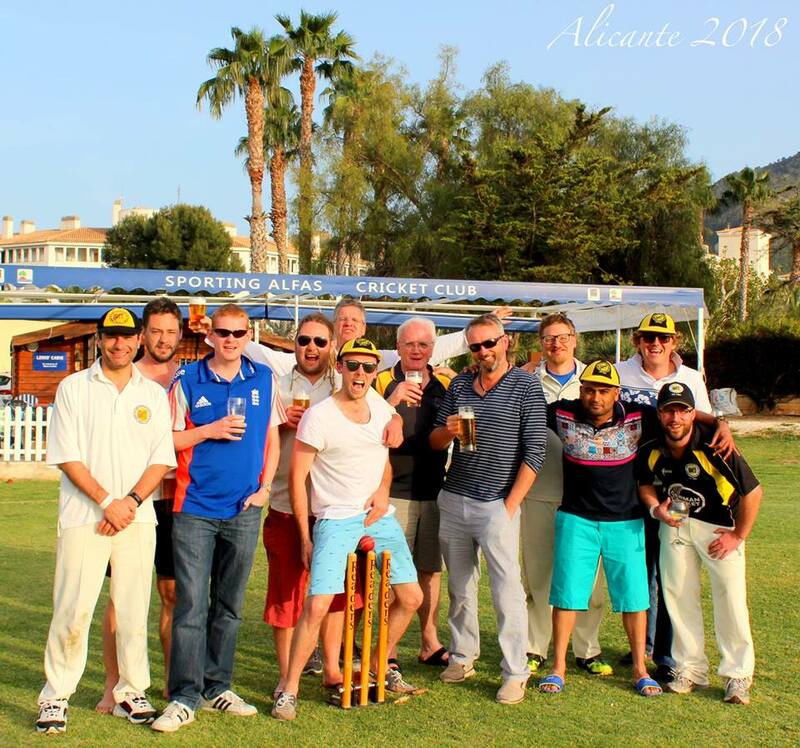 MCC were very excited about hosting the match with the current league leaders at the Hirschanger, having beaten them in a thrilling friendly at their ground in Erlangen last season. Captain Weston was winging in from KL on the Friday evening and, in fact, joined us at the Chinese Tower to discuss pre-match strategy after commandeering the internet connections on the flight home via Dubai to order us to mow the shi** out of the pitch before laying the Flicx at Friday`s practise session, in order to give our quickies all the help we could. Later on Friday the heavens opened with torrential rain and the rain continued until around 08:30 on Saturday morning. The Erlangen team had already telephoned and texted asking what would be expected in the afternoon and were told, no problems, we will get the match in. As often happens in Munich, by the time the game began the clouds had blown away and we had a beautiful, hot, sunny afternoon. Captain Weston used Maria Theresa to lose the toss but remained certain we would win the match as the correct coin was used. Superstition reigns supreme in some quarters. FVSE chose to bat and opened with Satish and Bilal to face MCC`s opening pair, Scott and Ferguson. The outfield was still wet and it was difficult to score any boundaries even if the ball was hit well which was apparently difficult to achieve, the first wicket, Bilal, falling to Ferguson for 8 in the 6th over with the score on 16. Ferguson also accounted for Satish who went for 9 in the 8th over with the total now 21. Wyanand a South African and Wasif scored very slowly but FVSE lost no more wickets before the drinks break when the score was 50 for 2 after 80 minutes. FSVE appeared to be following the traditional ODI philosophy of saving wickets for a big charge towards the end. Wyanand was bowled for 16 by Clare in the 27th over with the total on 75. In the 32nd over Garner, the man of many voices (thank goodness for that “o”) had Akmal out caught by Rabbani for 19 and the score was now 102 for 4 down. In the 33rd over Wasif was finally out for 42, LBW to Clare and the score was now 113 for 5 down. There was a rather comical run out with Captain Gursher and Subjahit both just about at the same end. FSVE finished up on 149 all out after 38 overs which, considering the difficult batting conditions at the start, was a very competitive total. After enjoying a Sarma-special tea MCC openers Veser and O`Meagher took the field, O`Meagher hoping to be among the runs again and MCC requiring 3.75 runs per over to win the match. The bowling was tight and scoring difficult although Veser hit a cracking boundary six off his seventh ball. O`Meagher though was having problems and fell for 5 in the 9th over having faced 24 balls with the score on 25. Sarma and Veser pushed the score to 46 before Veser was out caught for 26 in the 16th over. Weston went for 2 in the same over and at the drinks break MCC were 70 for 3 needing just 4 runs per over from the remaining 20 overs. Ferguson and Sarma carried on at just about the required run-rate until Sarma went, bowled for 28 in the 26th over with the score on 89. Clare and Ferguson had a partnership of 39, Clare being bowled for 16 in the 34th over, the score now 128 for 5 and 22 runs needed off 6 overs. When Ferguson was bowled for 29 in the next over MCC were 129 for 6. Rabbani stayed only a short while and after 37 overs MCC were 132 for 7 down and needing 18 to win off 3 overs. Furlonger and Gill put on 11 for the 8th wicket but Gill was bowled for 3 in the 39th over to be replaced by the man of many voices who played dot and a 1 to keep the strike for the final over with MCC needing 7 runs for victory. The first two balls of the final over were wides, greeted with great enjoyment by the spectators then a single to leave Furlonger facing, needing 4 runs from 5 balls. He upped his strike rate and took a single off the first ball so leaving Garner needing 3 off 4. The first ball was met with a massive swipe to be a dot ball, 3 runs needed of 3 balls. Then, joy of joys, Big Bird tonked the penultimate ball for a massive six over square leg and MCC had won a thrilling match with 2 balls to spare. Helmuth`s cool fresh took a hammering in the after match celebrations before we retired to the Chinese Tower for a post match strategy discussion. There was some dispute over the score book, Rabbani claiming he had scored a single and not moved up the duck race table. This claim was, of course, rejected until Rabbani drove the chairman home and passed over a sealed brown envelope so he is credited with 1 run and Furlonger finished up with 6 not out rather than 7 not out. The Hischanger wasn`t available for our home fixture so we arranged to play the match in Tegernsee`s picturesque ground. A large party of nineteen or so gathered at the main station by the BOB ticket desk for the 10.15 train. Sobek brought a cooling box with food and he also had some ladies to share the onerous task of watching with him. However on the walk from the station to the ground he got diverted to the Tegernseeer Brauhaus and we didn`t see him or the ladies for some while afterwards. Nevetheless, Palfrey, who had missed the train but took a later one need not worry as he made a new friend in Sestan who took a cooler with eight cans of cool fresh in it. Scott had left his hotel in Hamburg at 7.30 am to head for the airport and arriving in Munich left for Tegernsee without going home first – there’s dedication for you. Veser and family also drove down as did Rabbani and Blades, complete with the kit. Skipper Clare won the toss – be warned Weston – and chose to bat. It is a small, but beautiful ground with snow topped mountains in the background. Veser and O’Meagher opened and put on a very good partnership against good Tegernsee bowling from Saleem and Govindar before Veser was out, caught behind, with the score on 51. Wright and Veser then put on 21 before O`Meagher, complete with a new bat from New Zealand, went for 23 in the 14th Over. Ferguson came and went, joining the duck race, after receiving what, from the square leg umpire’s position, looked to be a bummer of a decision. Then came hard hitting Rabbani, who top scored with 38 before being LBW in the 21st over with the score on 175. Blades and Garner joined the duck race, Algar and Hobbs enjoyed some lusty hits, Hobbs sacrificing his wicket going for a second that wasn`t on in the 39th over and MCC were all out for 205. Ferguson and Blades opened the bowling for MCC and for me it was an unusual opportunity to see how our bowlers were as I usually stand in matches between other teams. Tegernsee were up with the run rate but, in the 6th over Blades struck twice and Tegernsee were 31 for 2. Ferguson got a wicket in the seventh over and Blades another in the 10th over leaving the score on 49 for 4. Garner and the long distance traveller Scott come on and bowled very tightly, the run rate dropped and the game looked to be in the bag and at the 20 over drinks break Tegernsee were 76 for 5. Blades had taken up a fielding position at third man, close to the volley ball pit and the young amazons playing there – its a hard life for some. Rabbani came on in the 21st over for a short spell of four overs in which he took 2 for 24, Hobbs tried to repeat his performance from Bucharest but got hammered for three fours in a single over. Tegernsee were all out for 142 after 32.5 overs despite a splendid defensive stand by Denish Ritigahapoln, who top scored with 36 not out. After the match we stayed at the ground sampling Tegernseer helles until they ran out and had only Weissbier on offer. We then retired to the Brauhaus to admire the spectacle of Hobbs devouring a Haxe in under five minutes and took the 9 pm BOB back to Munich. By this time, Palfrey was reduced to a glassy stare, Algar slept all the way dreaming of long white clouds and the 12 runs he need to make his 1000 for the club. Sobek treated us to a hilarious German lesson and some yoga dancing in the isle. All in all a wonderful day trip and, as skipper Clare remarked, perhaps we should arrange to play all our league matches against Tegernsee away. Scott, not out, 1, 5 overs, 2 madns, 15 runs, 1 wkt. An awful day dawned, overcast, not raining but there had been rain in the night. An hour before the match captain Weston sent out a message that having talked to Pak Orient, the game was definitely on and scheduled for a 1230 start. In the meanwhile it had begun to rain, not heavily but more than a drizzle. A few MCC stalwarts gathered outside the ground, wondering where the opposition were for 10 minutes or so when finally about eight of them arrived, having travelled up from Rosenheim. 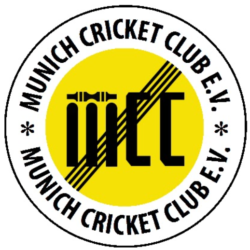 MCC numbers had now increased to eight, including a new, keen member, Tejas Jadwani who was getting a brilliant introduction to Munich cricketing weather. Unfortunately we had some five bail outs, disrespecting the cricketing tradition of turning up at the ground to experience the match being called off. Ibrihim had sent an SMS advising he was on his way from Rosenheim and Wrighty confirmed he was coming too, bringing MCC up to ten. It continued to rain and the sensible thing would have been to cancel the fixture but the opposition were very keen, as many of them had travelled a fair distance to get there. Also O’Meagher stated that they played club cricket in the north of England in such weather and we didn`t want to be labelled a bunch of poofters, like the bail outs, by Yorkshire members of the club – eat dirt Steven Pryke! So the match was on and captain Weston duly lost the toss, a very bad toss to loose in retrospect. The scorer settled down in his Zuoz attire – thick woollen shirt, long sleeved MCC sweater, a hoodie, a padded winter jacket, an MCC cap and a pair of gloves plus a battered umbrella and a flask of steaming tea. Ferguson opened the bowling with a no-ball and demonstrated that it was going to be extremely difficult to control the ball at any pace. In fact MCC bowled 32 wide balls and 8 no-balls making an extra 6.4 overs to be bowled and endured by the freezing scorer whose tea flask had been shattered by a six hit towards the end of the Pak Orient innings. Pak Orient had scored at around 7 per over up until the half way stage when they turned up the screw and finished with 248 for 9 after the allotted 25 overs. It was very difficult to keep the score, all the fielders’s were dressed like Scott’s Antartic expedition and there was no scorer from the opposition to help. They even retired one batsman after he reached fifty and replaced him with Omar Khan without advising the scorer who enjoyed a vicious revenge when Omar asked how many he had scored, only to be told, none, because you were not listed in the batting order. MCC bowlers did their best under shocking conditions, the best probably being Ferguson who went for 34 off his five overs and only bowled three wides and one no-ball. After a short break enjoyed in the warmth of the changing room, Sarma and Wright opened for MCC against the bowling of Suleiman and Sheraz. Suleiman had trouble controlling the ball, as had the majority of MCC’s bowlers and he put down seven wides in his two overs finishing with 0 – 24. He was replaced by Omar who showed that it was possible to control the ball but nevertheless, the MCC openers were very aggressive and scored at ten an over until Wright was out, caught off Omar’s bowling for 21 in the seventh over with the score on 57. Algar came and went, being run out without facing a ball – the second time in his career with MCC and Sarma went in the same over for 25, the score at the end of the eighth over being 60 for 3. Ferguson, DNB, 5 overs, 0 mdns, 34 runs, 1 wkt, 3 catches. MCC, 114 for 4, lost to Pak Orient, 248 for 9, by 134 runs. MCC man of the match, Ferguson, tight bowling, fewer wides and three catches.